Bolognese is one of those dishes that food bloggers rarely write about, probably because everyone already has their own recipe, as though it is an integral part of inherited human knowledge. However, the public at large still seem to buy jars of the damn stuff or develop poor imitations of what this classic dish should be – this recipe cometh to set the record straight. A good Bolognese recipe, frugal or otherwise, is just as important as any other… Oh look, here’s one now! The most important consideration when making Bolognese, other than flavour, is consistency. In my opinion, which may or may not be valid, its texture needs to be almost like that of a sauce. The best way of achieving such a thing is to cook the meat separately to begin with, allowing you to break it down a little. Being able to finely dice vegetables also helps – no one wants to be gnawing on a lump of celery whilst eating an otherwise scrumptious Bolognese. In terms of flavour, your Bolognese, whether you follow this recipe or not, simply must pack considerable punch. Carrots, celery and onion provide the dish with an awe-inspiring base on which the garlic, rosemary and other mouth-watering constituents are able to build. Of course, the addition of red wine is optional, though highly recommended if you happen to have some close at hand and a flavoursome homemade beef stock will always be better than an equivalent cube. Don’t skimp on the olive oil either, it adds a devastating richness and a velvety quality to the proceedings and is almost as important to the recipe as the meat itself. Basically, hurl everything you have at this recipe, excepting the kitchen sink, it’s worth it! 1. 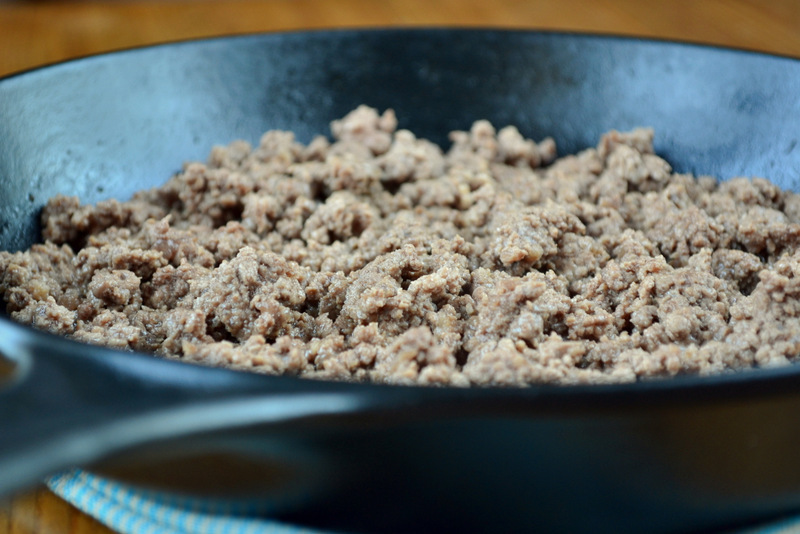 Heat a slosh of olive oil up in a frying pan, break the mince into it with your fingers and cook through. Meanwhile, fry off the onion, carrot, celery and pepper, until translucent, in a generous amount of olive oil. Add the meat and garlic to the vegetables, stir until fully incorporated. 2. Add the tomatoes, tomato purée rosemary, bay leaves, vinegar, beef stock, wine and lentils – stir thoroughly. Add some more olive oil for good measure and cook for at least an hour, two is preferable. Make sure the sauce is reduced until thick and rich, season and serve with spaghetti and garlic bread. Cost: As my tips section will tell you, the best way to conserve money when making a dish like this is to bulk it out a little with ingredients other than meat. I can guarantee you that if you ate some of this you’d never be able to tell it contains lentils, yet they do give it a little more body and help it go that little bit further. 300g of beef mince really is enough for four people, I assure you. As such, this entire Bolognese sauce should set one back no more than £3.70 without the wine and a little more if one includes it. This looks delicious and I really like the addition of red lentils! Thanks! Me too, they work so well! 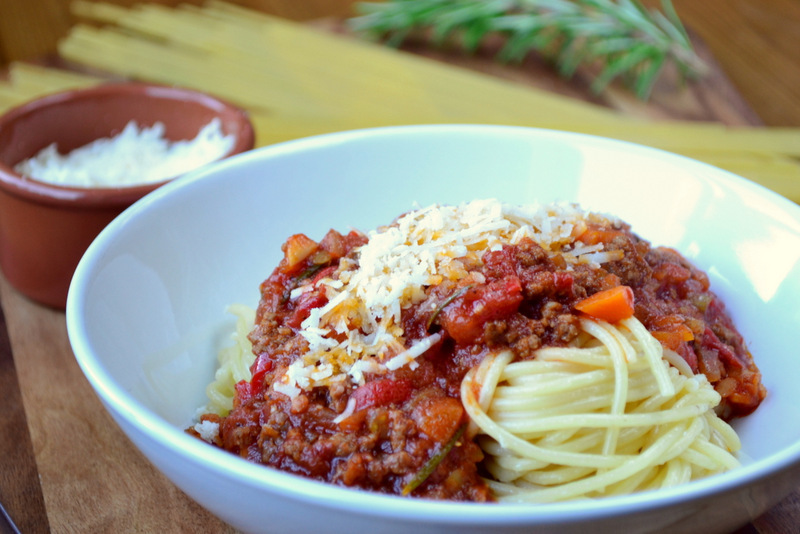 I thought the rosemary and some of the other ingredients were different from classic bolognese and was interested in how the flavor would change. Sounds like it was delicious. No, I know it is a little different! I think they contribute a lot though! 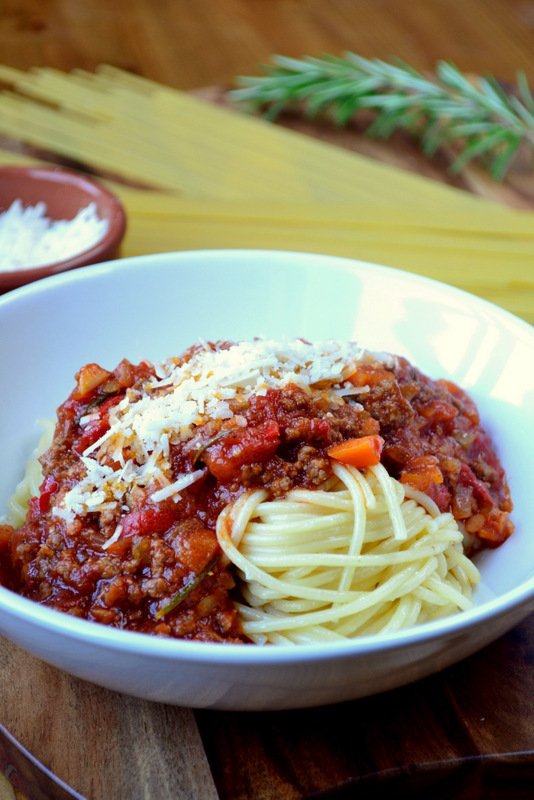 Fantastic post, bolognese sauce is my freezer staple. I mix my mince beef with Quorn to make the the dish stretch a bit further and all the carnivores I have fed never noticed. Thanks so much! It’s so hard to discern things like quorn and lentils. Give the latter a go, much cheaper than quorn! I was going to say that this is a beautiful classic! Nick, this was one of my all time favorite meals before you know what 🙂 I love your take on it. Presentation is very good and it look delicious . I absolutely enjoy reading your posts. Your prose is captivating. Can’t wait to try this recipe! One of my cooking goals is to try to make more Italian dishes. I am going to print this out right now to try soon. Thank you for sharing it! Great stuff! I hope you enjoy it! Thanks! I’m afraid the logistics might be a little tricky :D. Pay for the ticket! I think everyone loves bolognese! Haha – we called it spag bol/bog too! I’m glad you agree! It’s just not the same without the red wine! If all else fails…marmite! mmm I like the idea of using lentils, balsamic vinegar and rosemary! Hehe – we have more for tonight, yum! You are killing me. I’m trying to hold off for another 30 minutes before I have lunch. Now I can’t hold back! haha I can’t wait to make this for dinner next week. Thanks for sharing! Hehe – sorry! Don’t take me to court. Spag Bol, certainly is a classic, and my recipe is almost exactly the same as yours(minus the lentils), but I add a couple of tbsps cream or whole milk just before serving, it just rounds off the flavours really nicely. One of the most important things I think is to make sure the mince browns and not boils. Indeed! Oh great, someone else who does it right :D. That sounds nice, perhaps I’ll give it a go. Have never put in lentils before but will do next time ! Haha – dreadfully sorry! You must! My husband and I took a cooking class on our recent trip to Italy in Bologna where one of the things we cooked was “ragu” which is what people in Bologna call Bolognese. I was sort of disappointed that it wasn’t what most of the rest of the world thinks of as Bolognese with only pancetta, ground beef, onions, carrots, celery, wine. No garlic, no tomatoes. Needless to say I am not a convert to this “classic” preparation and will continue to add garlic and tomatoes and next time lentils, too! Indeed, I’m not such a fan of the traditional version – it’s delicious, but not as satisfying as this! Great reminder of a staple meal! Bolognese is probably one of the first hearty meals most of us learn to make and it can be made just about anywhere in the world! I love it and you’ve inspired me to get it back into my meal rotation. absolutely! I’, so happy I did! That’s a nice idea – perhaps I’ll give the pork mince a go. 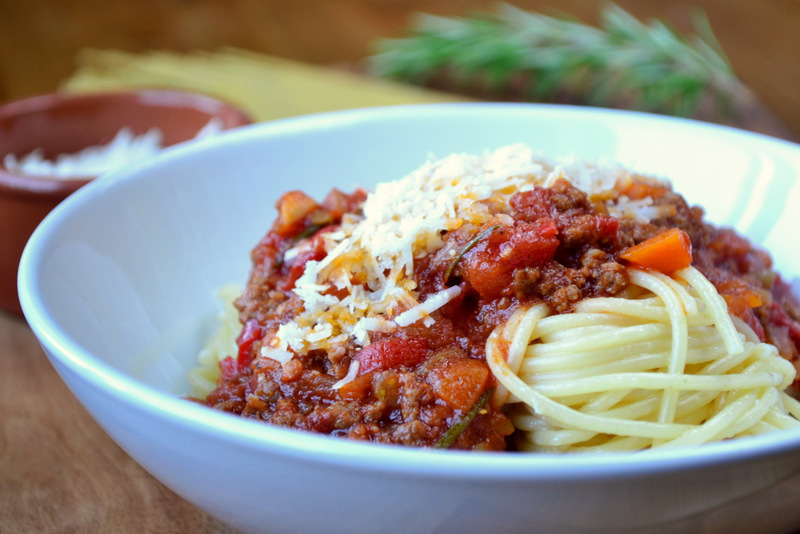 I’ve never added Rosemary – your Bolognese looks awesome! Oh you should! You should! I miss this dish a lot, I used to make it often too! Your post are always fancy with wonderful pictures. Hello! I love your blog so I decided to nominate you for the blog of the year 2012 award! Thanks! Please do, the lentils add a lot of body! Look delicious. I’ll definitely try your recipe. Thank you! This sounds like a great recipe. And I love how you added in the tips about the lentils. They make a worthy ingredient to any recipe. Love this. Thanks! The lentils, even in such small quantity, add a hell of a lot! Nick since I don’t eat beef I can’t comment much except to say that your photos look really delicious! Ah, well – thanks and I appreciate the comment and your clicking on it even though you don’t eat beef! Bravo Frugal!! You’re right, most food bloggers wouldn’t post a Bolognese. But this is why you are not “most food bloggers”. 🙂 A true Bolognese… Frugal style. Love the addition of the lentils too. Delicious! Thanks, Karista! Haha – I do try to be different :D. The lentils are probably my favourite addition actually. Fantastic! Great stuff – give the rosemary a try, adds a little fragrance. Looks delicious! Love the addition of lentils. Thanks – they really give it a great texture. I’d say it’s time for me to break out some of those tomatoes I froze in September! Your recipe makes me yearn for wintry meals of pasta and meat sauce. The tip about adding red lentils is genius! Ah yes! Great idea! The red lentils really make this dish perfect! But yours looks awesome. Love the addition of the peppers. Love your take on this. There is nothing worse than a jar of too sweet Bolognese. I”ll try the lentils next time too. Thanks, Julie! You must, they work very well. Thanks! It’s my favourite version. very cool. Never thought of using the lentils for this recipe, sounds great. You must – they won’t disappoint! I am a lentil fiend! This is a fantastic recipe for me, love it! Oh me too – I can’t get enough! This looks delicious!!! I wanna try it this weekend! Thanks! Please do, it’s so delicious. I never tire of bolognese. I’ll have to try this with the red lentils. Me neither! Please do, they work extremely well. I didn’t really get far down your page (basically the bowl of bolognese stopped me in my tracks) before I decided to follow you! I can tell I’m going to get fat reading your site! Challenge, accepted. Beautiful composition on this! I can’t wait to try the dinner! Very interesting to have added lentils to a classic dish.. what a great idea! Thanks Barb’ I feel they give it a little extra body!